In the Buffalo area, when we talk about creating year-round garden interest, what we really mean is: How do I make my garden look good in autumn and winter? From May to August, it’s easy to have beautiful landscaping, flowers and lots of color. All the garden walks are scheduled during that period, so we can find plenty of inspiration for summer gardens. But what if we’d like our gardens to be pretty now and throughout the winter? Jennifer Guercio of Buffalo has lots of tips. 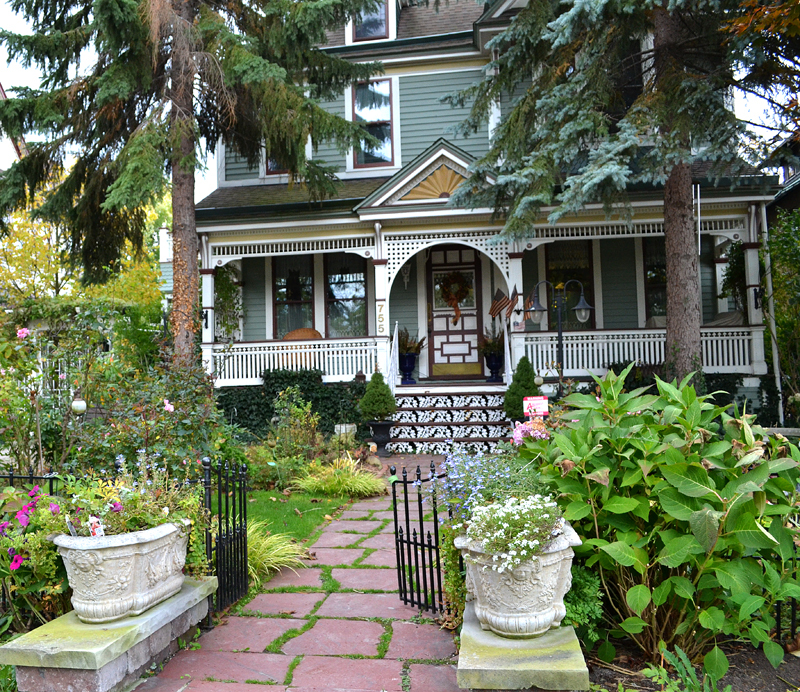 Her gardens have been shown in Better Homes & Gardens and Garden Gate magazines, and have been included in information on Garden Walk Buffalo and the National Garden Festival. She tends the gardens not only at her home, but at two other homes she and her husband own on their block. We’ll give you a glimpse of her garden now, a time when many of our gardens have little going for them, and share some of her tricks for having year-round garden interest. 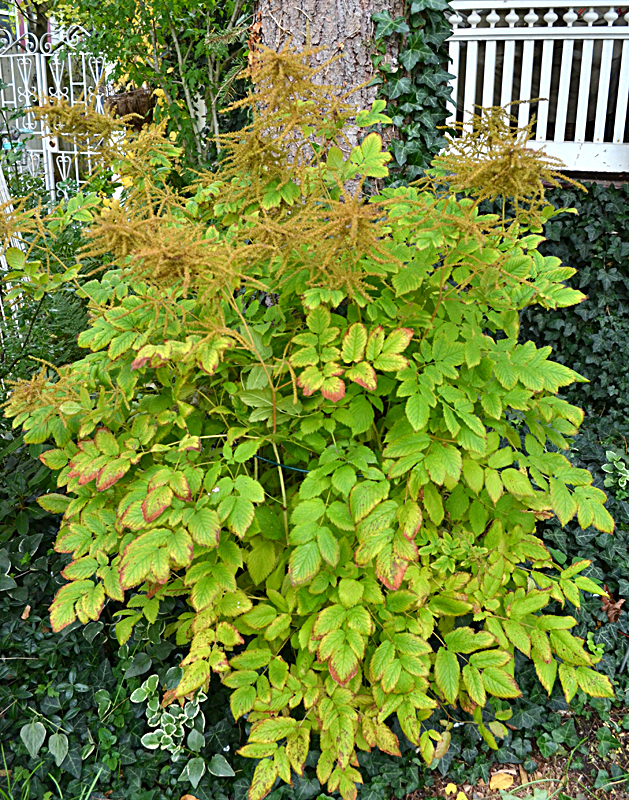 Tip #1: If you want flowers in autumn, plant perennials that bloom in autumn. Take a look at these beautiful Montauk daisies at left. They just started blooming a couple weeks ago and were at their peak when I visited Guercio’s garden last week. They generally bloom at the end of September, but they were late this year because the weather has been so warm. 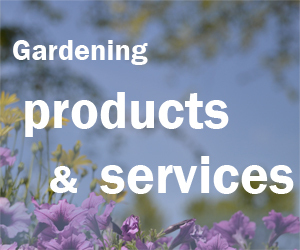 Many people don’t have wonderful perennials that flower in autumn because they go to garden centers in the spring and pick up what catches their eye– and what catches their eye is what’s flowering in spring. You can still find perennials in garden centers now– including plants that bloom now– and those plants are on sale! 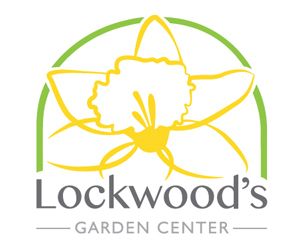 Hurry in to garden centers now to find fall-blooming plants. 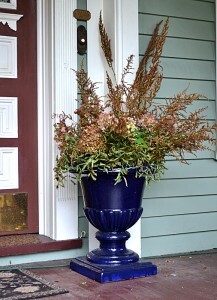 Asters are a great plant for autumn blooms. Mums are the emblematic fall flower, but they’re not exactly perennials. You may need to take a few extra steps to get mums through the winter. Here are six more suggestions for great autumn plants. 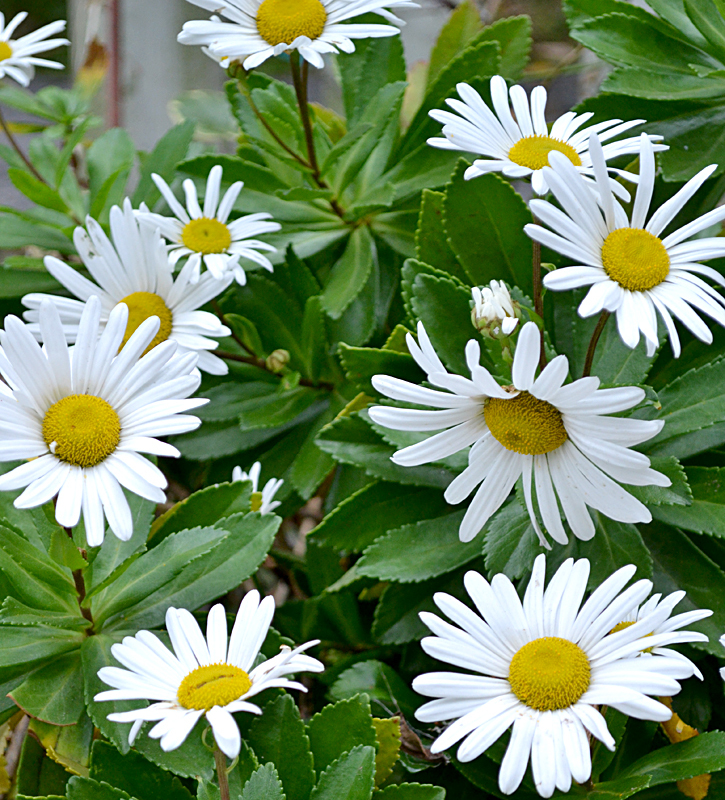 Montauk daisies have a lot going for them besides their beautiful flowers. They’re easy plants to propagate. Just cut off a woody stem and stick it in the ground, Guercio said, and it will grow. The leaves have a lovely light scent, she pointed out. It reminds me of soap. “It’s delicate and fresh, isn’t it?” she said. Montauk daisies do get heavy, though, and you may have to support the plant so it doesn’t break. 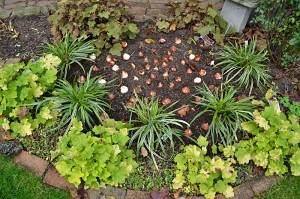 Heucheras and ornamental grasses surround a bed of tulip bulbs. “I try to do as many evergreens as possible,” Guercio said. When we think of evergreens, we tend to think of those huge pine trees that we see in the photo at the beginning of this article, or even the small potted shrubs on each side of her porch steps. Ivy, which you can see on the porch railing, stays green throughout the year. Then there’s the rhododendron. We think of it as a spring plant because it gets magnificent blossoms in spring, but its green leaves look great in autumn and winter, too. 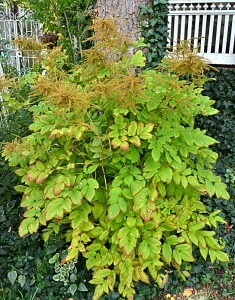 In autumn, the flowers of this goats beard and other kinds of astilbe add texture to the garden. Other plants that keep leaf color into fall include huecheras (hear the pronunciation of heuchera). The National Garden Bureau has named 2012 the Year of the Heuchera. As you can see in the photo above right, heucharas come in many different colors and keep their colors into fall. Guercio, a painter, likes to arrange plants as if they were paints on a canvas. Guercio was planting tulip bulbs when I visited her garden. There will be bright red tulips in the middle, surrounded by lovely orange tulips, which will be very showy come spring. Let’s talk about spring gardens for a moment. 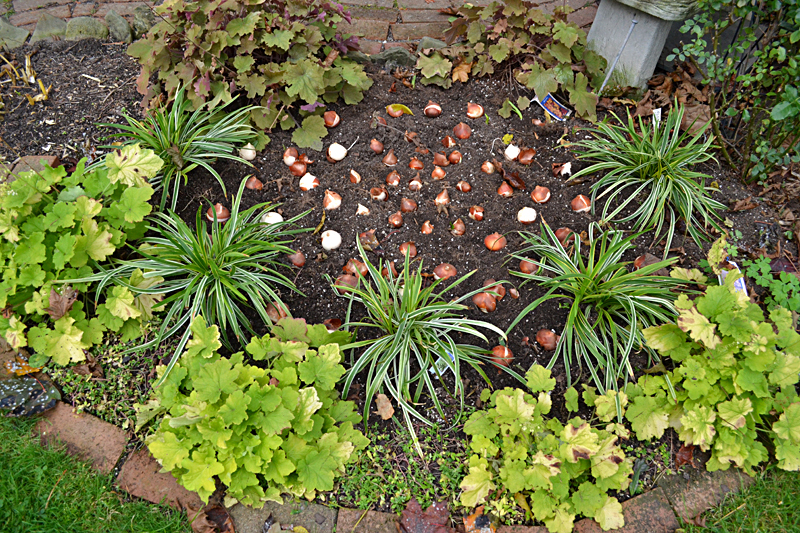 While most of us plant spring bulbs and just leave them in place for years, Guercio changes this bed every year. After the tulips have finished blooming and she’s ready to plant annuals in that spot, she digs up the bulbs– whether they’re ready or not. You’re supposed to wait until the tulip leaves have died back and are brown and dry. An arrangement of dried flowers from your garden can be used anywhere in your landscape. If they haven’t reached that stage, she digs the bulbs up anyway, leaves and all, and puts them in a box outside in natural sunlight. She keeps the bulbs protected from rain so they don’t get moldy. When the leaves snap off easily, you can store the bulbs inside until fall. She plants the bulbs she dug up in a different bed. Bonus tip: Don’t buy exotic tulip bulbs, Guercio said. She finds they don’t last well from year to year. You’ll get more bang for your buck with the common varieties. One last thought on autumn color: Some plants change color in the fall, and that’s not a bad thing. For example, Guercio has hostas that are bright yellow and add impact to the landscape. Above left you can see goats beard, a plant in the astilbe family.Even though the flowers are rather dry and no longer colorful, they still add texture to the garden. Guercio also cuts the flowers and uses them in dried arrangements outside. Check out the photo at right. Even after it loses its leaves, the umbrella shape of this trumpet vine will add interest to the garden in winter. Notice the trunk, too, which looks almost as if it was braided. “The other day I was in a hurry and I just threw them in,”she said. She added some dried hydrangeas, too. 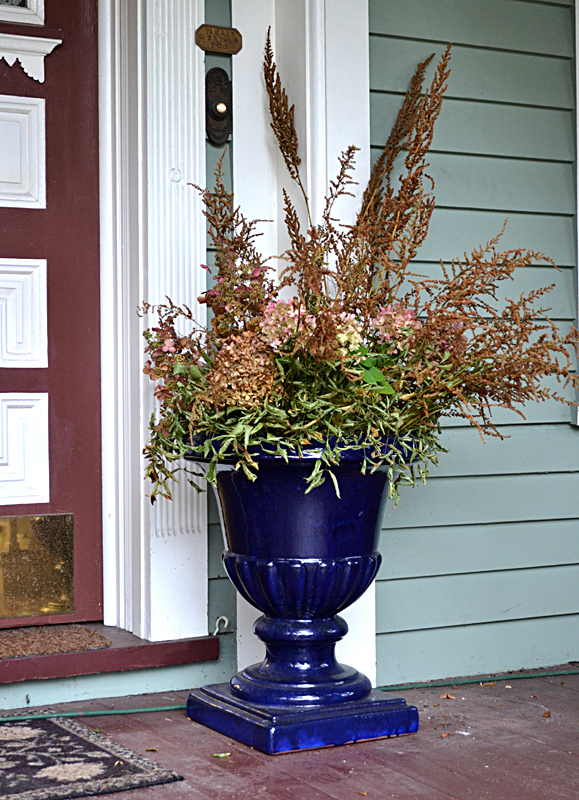 This arrangement looks welcoming at her front door, but you can use something like this anywhere in your landscape. Other dried materials you might consider for your autumn garden are canna lilies, which get very tall. Some people like to decorate with corn stalks at this time of year, and Guercio has used canna lily stalks in the same way. In the winter time, there won’t be much color in the garden, so you want plants that will provide interest with their form. Look for plants that don’t die back completely. We already mentioned the ornamental grasses, whose shapes look lovely in the snow. 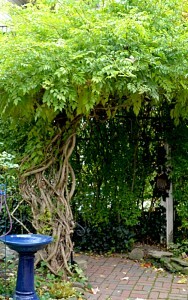 Another choice is something like this great trumpet vine, with its fantastic gnarled trunk. The leaves will fall off and Guercio will trim the branches, forming a large, beautiful umbrella shape. Bonus tip: See Guercio’s tip on making a heart-shaped trellis. This really is one of the most beautiful gardens on the tour. I did not know they owned two more homes. That really is a labor of love. Huechera (coral bells) are my new favorite plants. I planted a bed of all heuchera this summer. And I know they’ll pop right up right after the snow melts. They come in all sorts of colors and don’t need deadheading. And they’re perennials! Only have to buy them once. It’s the plant I’ve been waiting for all my life. Donna, even now her gardens are beautiful. It’s not everyone who would be willing to show you around their garden in October! Jim, I’m seeing more and more huechera on garden walks, and I’m beginning to see why! Thanks for explaining why you’re such a fan! Liz, thanks especially for pointing out that you can find varieties to grow in shade. Since downy mildew is damaging impatiens, coral bells or heucheras might be a good replacement. I didn’t realize all the wonderful traits of these amazing plants! I love the idea that you planted coral bells at the Community Music School! Maybe you should do a whole musical theme in your landscape. I did an article on a homeowner who selected plants based on their names– they all had biblical or religious names. Nancy, as I was admiring the beauty of Jennifer Guercio’s garden, she pointed out: “And there’s not a mum in sight.” A dried flower arrangement is a nice alternative to mums: it’s easy, it’s cheap, and it allows you to add focus where you want it. She had such wonderful tips! 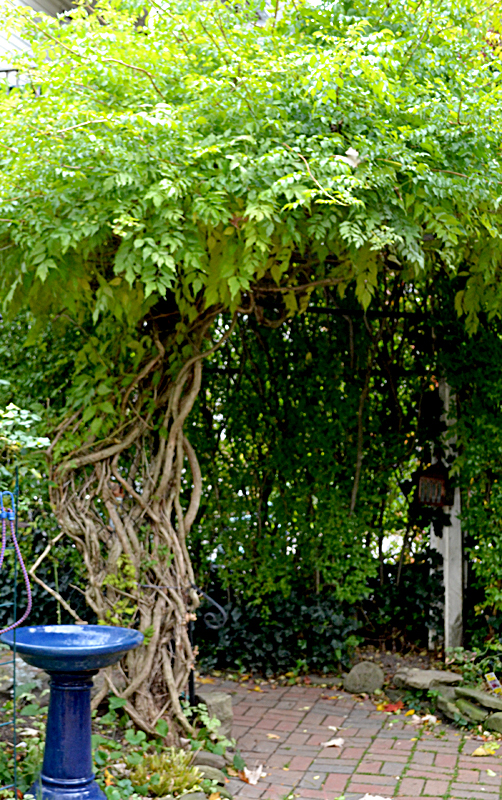 I am in the process of “shaping” my trumpet vine into a tree-like form like the one in Jennifer’s garden. It is so vigorous and lush that I had to do something to make it more welcome in my average sized garden with insufficient support for this uber-vine to climb freely. I’m glad to see it used this way since the hummingbirds love it. Thank you for sharing these tips. Maintaining your garden in fall is one of the toughest things in gardening, but despite the hard work it always pleases me to see the outcome. Especially because in fall the whole place shines with many beautiful colours. I´ve started focusing on gardening some time ago. Only later I realized that I shouldn’t only focus on the specific period of the year garden maintenance. I understand it´s important, but your year-round approach is much better and more suitable. And I have to say your suggestions inspired me. They are very well listed and go straight to the point. And I also want to say that you have great looking garden. Not too big, not too fancy. It´s like I can feel the life and peaceful atmosphere in there. Jamie, thanks for your comment. I see that you’re in real estate. We really create our gardens for our own enjoyment, but that curb appeal may help if we ever decide to sell the property.